The Midnight Dreamer tunnel tent sleeps up to four – perfect for small groups and families. It uses alloy poles for a high strength to weight ratio, coupled with our Storm Guard System and wedge shaped porch provides water-free access to the spacious living area with a sewn in groundsheet and large vents to control air flow. Features a divider to create two compartments. The Robens Adventure Range provides a choice of four tents that prioritise spacious living with generous headroom – the perfect attractively-priced family/group base for all outdoor adventures. The quality materials are carefully developed to match design expectations and include our tough HydroTex 5000 polyester fabric in new two-tone brown, and alloy poles with our Storm Guard System for weather-beating performance. 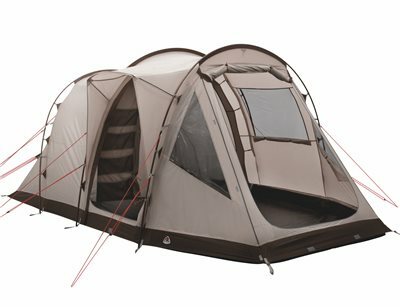 New for 2019- all models benefit from new pole sleeves and PE floors; the Midnight Dreamer and Double Dreamer now feature Rain Safe side door; new low vents on Cabin tents enhance ventilation; ad the shade Grabber extension features adjustable side walls to tailor protection to an outside living area.